I'm so excited that it's strawberry season and grill season! 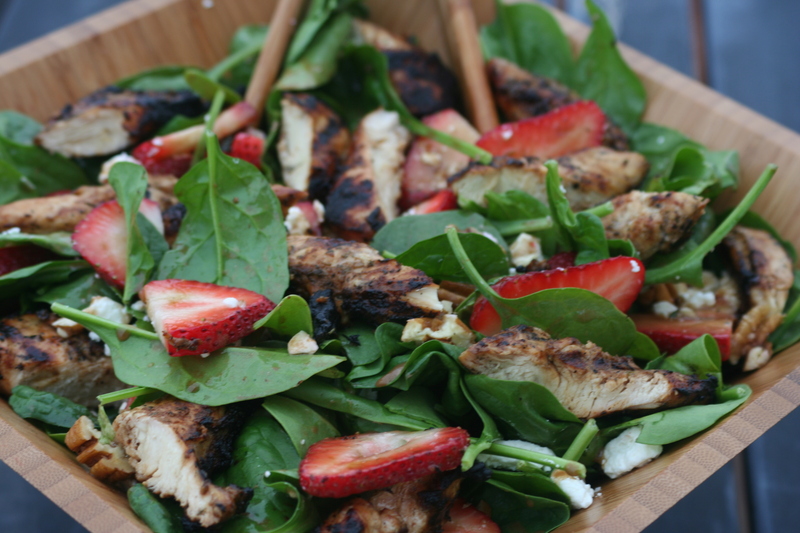 I combined the two into a Balsamic Grilled Chicken Strawberry Salad. This was so delicious and so summery and the colors are stunning! This will definitely make a frequent appearance on our summer menu! Combine first five ingredients. Place chicken in a bag or container and pour marinade overall. Marinate for at least 1 hour. Grill until chicken is fully cooked - juices will run clear. Arrange on a platter or in a salad bowl. Top with grilled chicken. Drizzle dressing over all. Combine all ingredients and shake or whisk well to combine. This flavor combination just screams spring to me. I love the pop of color and sweetness the strawberries give. It's only 10am and I'm already hungry! Gouda cheese is my favorite with this!! And yes, I am obsessed with all things berry during this season as well!